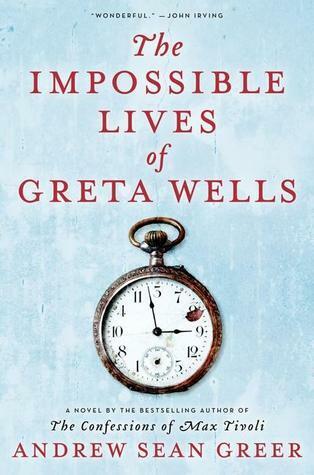 From the first sentence (“The impossible happens once to each of us”), I was completely drawn in, ready to be enchanted, and The Impossible Lives of Greta Wells delivered. I read it in one great gulp, and it’s already on my “to reread” list; because the time period changes, a slower (or second) read could help keep all the details and different storylines straight. The book begins with Greta in late October of 1985. Due to her twin brother Felix’s death of AIDS and her longtime lover Nathan’s leaving, she is suffering from depression, and is undergoing a course of electroconvulsive therapy. And then: “That is how magic works. It takes the least likely of us, without foreshadowing, at the hour of its own choosing. It makes a thimblerig of time. And this is exactly how, one Thursday morning, I woke up in another world.” This “other world” is Greta’s own, but in 1918: she lives in the same apartment New York, her aunt Ruth nearby, her brother Felix still alive. Eventually, it becomes apparent that there are three different Gretas, cycling through each other’s times and lives: 1918, 1941, and 1985. We follow only the original 1985 Greta, though the other Gretas leave traces of their activities behind, little things changed where they have left their own mark on each other’s lives. (“I was not borrowing these other Gretas; I was becoming them.”) In each time, the same characters appear: Felix, Ruth, and Nathan, as well as Felix’s love interest Alan and Greta’s love interest Leo. Each of the Gretas is receiving her time period’s equivalent to electroconvulsive therapy, so that the three Gretas rotate times on a schedule (a day in 1918, a week in 1941, etc.). However, when one Greta misses a treatment, the other two switch places (instead of cycling through all three) until she returns. As the original 1985 Greta nears the end of her treatments, she must decide where she will be happiest, and where she is most needed – in the present, or in the past. Those who enjoy the writing style of Simon Van Booy (Love Begins in Winter, The Illusion of Separateness) and the mind-twisting intricacies of time travel literature will delight in Greta Wells.